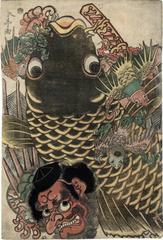 Kintaro struggling with a giant carp while being aided by a group of tengu. The tengu are mythical dwellers of the forests and divided into two classes: the ordinary human-shaped 'konoha tengu' with wings and a nose of inordinate length, and the bird-like tengu with a strong beak called karasu tengu (crow tengu). Both kinds are shown in this print. Carp (coi) are often represented leaping a waterfall and harken back to the Chinese story of a sturgeon of the Hang-Ho which, having swam up the river and crossed the rapids of Lung Men (Dragon Gate), became a dragon itself. At boy's birthday festival on the fifth day of the fifth month carp shaped kites are floated over housetops in Japan to encourage boys to rise to fame and fortune. There is an ehon illustrated by Shuntei and written by Nakamura Utaemon III that is filled with fantastic characters, including tengu. The title is 'Itogoromo tengu haikai' (糸衣天狗俳諧) and it is said to have appeared in 6 volumes in 1815. One volume is illustrated online at the Waseda University Library. Click on the link we have added.